I've been wanting to blog about this little book for a while now. It has had a great impact on me and I think all my lady friends should pick it up and give it a read. Seriously, do it. This little book is a quick but profound read. 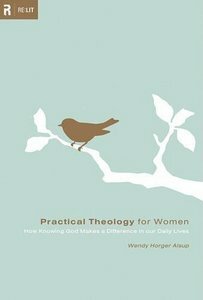 Wendy Horger Alsup has a heart for teaching women about theology and shows that understanding theology makes a difference in our daily lives. From the very beginning of the book Wendy implores women to seek God. "God has called you and equipped you to know him. We have no excuse to remain ignorant of his character. Seek God's face. Understand his character. Pursue knowledge of him, for apart from the 'fear of the Lord' and 'the knowledge of the Holy One' (Proverbs 9:10) we have no hope for being a wise mother, sister, wife, or friend." I used to be really afraid of knowing "too much" about the Bible. How silly. I could never know too much about the Bible. I guess I thought it was too much responsibility...and it is a lot of responsibility, but instead of fearing it, I welcome it now. There really is no hope for me apart from Jesus...and I need to try and understand Him better so that I may live a life that brings Him glory. I know theology sounds like a scary word...but all it really means is to study God. Christian women should not shy away from studying the Bible and learning everything they can about God. I once heard someone say that women shouldn't study the Bible so much because their husbands might feel inadequate because their wives know more about the Bible than they do. [Believe me, it took everything I had not to ring this person's neck] To that, Wendy has an amazing response, "God forbid that women should avoid studying the deep things of the Word lest they surpass the understanding of the men in their lives! Studying theology–such as the Holy Spirit’s role in convicting man of sin, and God’s sovereignty over all creation–will curb, not enhance, a woman’s sinful tendency to nag and manipulate her husband. My husband can bear witness to the fact that a better understanding of God’s character, that is, theology, makes me a better wife." Thanks, Wendy! You don't have to go to seminary or be a big-time scholar to learn theology. This book is a great start to learning about theology. This book covers some big main points: What is Theology?, Who is our God?, and Communicating with God. Going through these easy-to-read chapters will get you comfortable with thinking more deeply about these topics. And Wendy provides some great practical insights to go along with the biblical truths she is expounding on. I promise you, this book is definitely not boring and it really ministered to me like reading a devotional would. Don't be afraid to step up your study of God, ladies. The fear of the Lord is the beginning of wisdom; all those who practice it have a good understanding. His praise endures forever! -Psalm 111:10. Check out Wendy's blog here.